The Tony Awards air this Sunday, but for those not willing to “Wait For It,” CBS has released a 360-degree Hamilton preview video on Facebook. 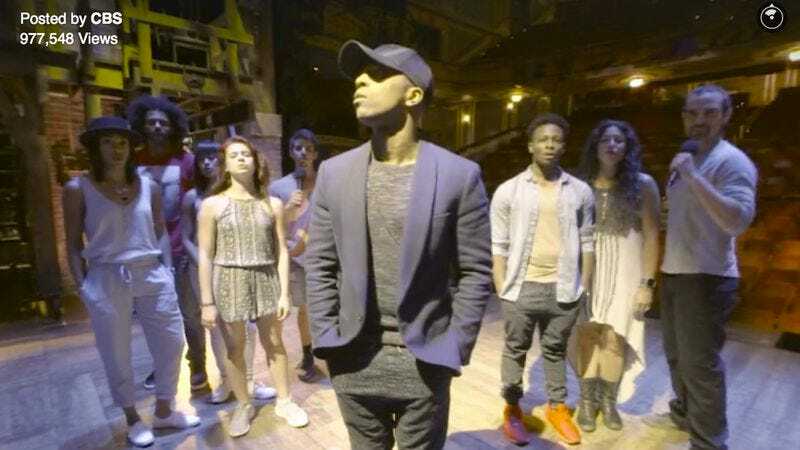 The video features Leslie Odom Jr. and the cast performing the Act 1 song that explores Aaron Burr’s inner conflict over Alexander Hamilton’s meteoric rise to prominence. It’s an a cappella version specifically staged for the 360 camera, so while it doesn’t give viewers a glimpse of how the song is actually staged in the show, it’s still a lovely showcase of the production—a production that racked up a record 16 Tony nominations. You can drag the video to view the entire cast as they surround Odom onstage—although be warned that Facebook 360 videos won’t work on Safari or Internet Explorer. Creator and star Lin-Manuel Miranda is standing about 90 degrees to Odom’s right (wearing a hoodie that says “SOMB”), and just to his right is music director Alex Lacamoire, who is conducting the song. You can also turn the screen upwards to get a better look at the Richard Rodgers Theatre and the Hamilton set. Though Hamilton is (obviously) going to be one of the 10 shows set to perform during the Tonys, there’s been no official announcement on what the cast will perform. Most likely it’ll be a medley designed to show off as many aspects of the production as possible, and this video seems to confirm that “Wait For It” will probably be part of that medley.